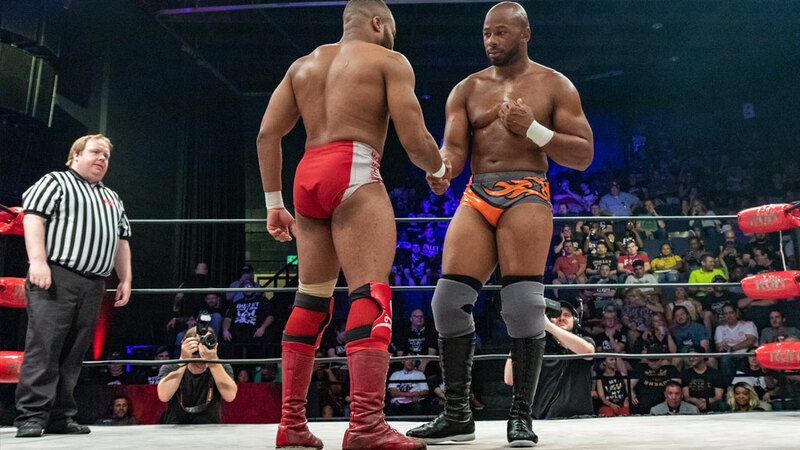 ROH World Champion Jay Lethal’s title defense against Jonathan Gresham in a 30-Minute Iron Man Match goes into a thrilling sudden death overtime! Plus, ROH World Tag Team Title co-holder Mark Briscoe clashes with SoCal Uncensored’s Frankie Kazarian! These two bitter rivals were already battling in the ring when the show came on the air, as the brawl had begun in the back before spilling out into the arena. Briscoe delivered a low blow behind the referee’s back, but Kazarian answered with a Lung Blower followed by a Codebreaker. After Jay Briscoe made his way to ringside to cheer on his brother, Kazarian nailed him with two boots to the chest through the ropes. Mark Briscoe took Kazarian down and went to the top rope, but he came up empty on a Froggy Bow attempt. The quick-thinking Kazarian rolled him into a Crucifix for the victory. After the match, Jay Briscoe entered the ring and attacked Kazarian. Kazarian’s SoCal Uncensored partners, Christopher Daniels and Scorpio Sky, made the save, but ROH World Television Champion Punishment Martinez evened the sides. Martinez has teamed with The Briscoes in six-man tag matches in recent months. Jay Briscoe hit the Jay Driller on Sky, and Martinez planted Daniels with the South of Heaven chokeslam. After The Bouncers picked up the win, Cheeseburger was checking on the condition of Nova when Ferrara suddenly attacked him from behind. The Dawgs double-teamed Cheeseburger. Ferrara hit Nova with Shotei, the palm strike finisher that Cheeseburger uses as a tribute to Jushin “Thunder” Liger. As Titus held Cheeseburger, Ferrara taunted his longtime rival. Cheeseburger spit in Ferrara’s face, but Ferrara responded by nailing him with Shotei. 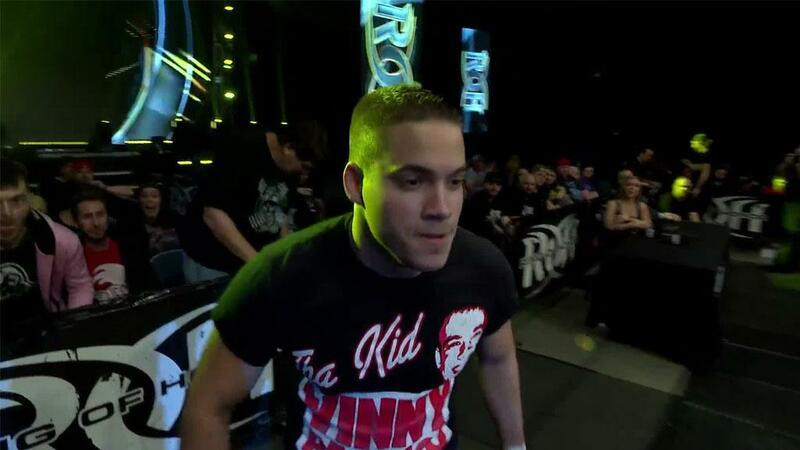 Two weeks ago, Bully attacked Flip Gordon after Gordon’s win over Young, and then Bully glared at Young and shook his head disapprovingly. Last week, in a tag match pitting Bully and Young against Best Friends Beretta and Chuckie T., Bully abandoned his partner. In footage from after last week’s show went off the air, an enraged Young confronted Bully in the locker room. The champion and challenger battled to an intense stalemate for more than 20 minutes before Lethal his his Lethal Combination for a near fall. After the 25-minute mark, Gresham hit a deadlift German Suplex into a bridge for a near fall. Gresham followed with a snap German Suplex and a hard forearm to the face that rocked Lethal. Lethal recovered and attempted Lethal Injection, but Gresham avoided it and trapped him in the Octopus submission. Unable to escape, Lethal had no choice but to tap out. All Gresham needed to do was avoid being pinned or forced to submit in the final 3 minutes, 30 seconds and he would be the new ROH World Champion. Realizing that his title reign was in serious jeopardy, Lethal immediately went on the offensive and applied the figure-four leglock. Gresham held on for as long as he could before finally tapping out with 90 seconds remaining. Knowing that he had just 90 seconds to realize his dream of becoming ROH World Champion, Gresham frantically began trying to pin Lethal, but Lethal kept kicking out, and the 30-minute time limit elapsed. With each man having scored a fall, the match was declared a draw. Gresham scored a near fall with La Magistral Cradle in the opening minute of sudden death overtime. Lethal came back with a Torture Rack and flying elbow off the top rope for a near fall. Gresham applied a sleeper hold, but Lethal escaped and countered with a cutter. Lethal followed with Lethal Injection for the victory after more than 33:30 of action. Both men received a well-deserved standing ovation from the crowd.